Project: Wedding Invitation & Thank You Postcards. Brief: The wedding was going to be held at a gorgeous Victorian venue set in a beautiful garden so a design that reflected that was requested. Solution: The visual theme was created by using flower and Victorian motif imagery in the wedding colours which were lime green and pink. The weddings colour theme was also reflected in the pink roses and lime green flowers. “Thank you, Sharon, for doing a fantastic job designing our Wedding invitations and Thank you postcards. 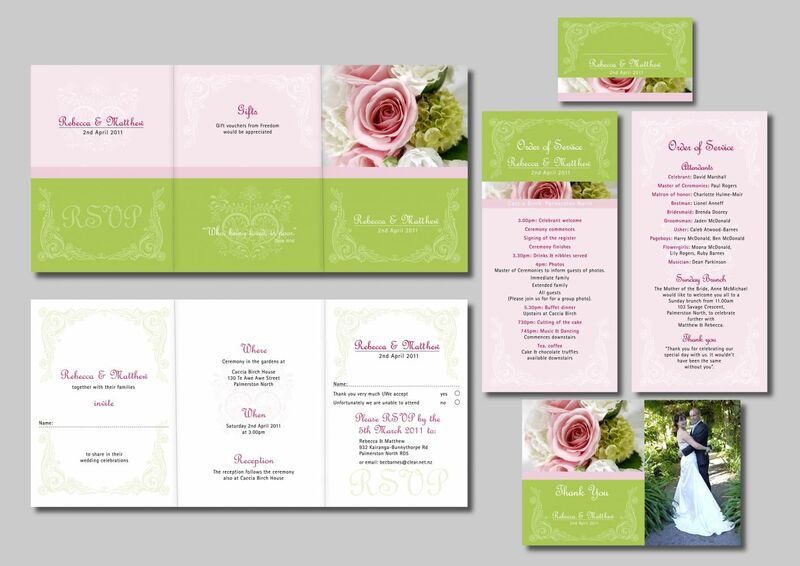 Mathew and I both loved the gorgeous Victorian design it was exactly the look we were after, the pink and lime green totally matched the other colours of our wedding theme”.